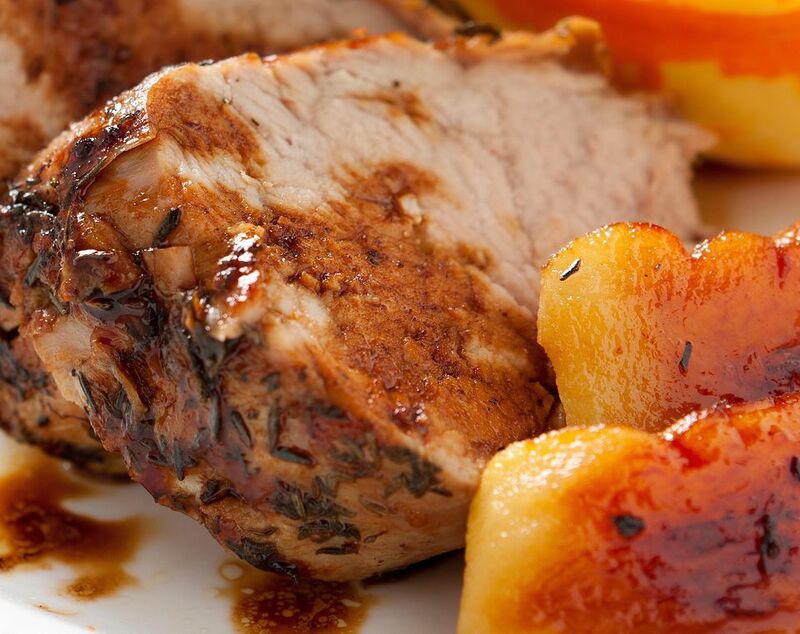 Pork and apples are a natural combination. This simple slow cooker meal for Apple-Glazed Crockpot Pork Roast cooks all day while you are away. The aroma that drifts through the house as the pork and apples slowly cook together is wonderful. The perfect cozy dinner for a cold and rainy night, you'll love this recipe, especially in the fall. Choose apples good for cooking for this recipe. They should hold their shape when cooked, and be a pleasing combination of sweet and tart flavors -- think Granny Smith, Pippin, Macintosh, Mutsu, or Honeycrisp. Don't peel the apples so they hold their shape. Just cut out the core and the stem end. A pork loin roast is the tender part of the pig on the back. Don't buy a tenderloin for this recipe - that type of cut is smaller, usually about a pound or a pound and a half total. The pork loin roast may be sold rolled and tied with a string. That is just fine for this recipe. This is the perfect recipe to serve with spinach cooked with garlic, soft dinner rolls or crisp breadsticks, and scalloped or roasted potatoes. Trim the pork roast well of any excess visible fat, then rub the roast with salt and pepper all over. Place the roast on a broiler pan. Heat broiler in the oven to high. Brown the pork roast under the broiler to remove excess fat, turning about every 2-3 minutes; drain well. Place the apple quarters in the bottom of a 4-6 quart crockpot that will hold the roast comfortably. Place the roast on top of the apples. In a small bowl, combine the apple juice, brown sugar, and ginger. Spoon this mixture over the top surface of the roast. Cover slow cooker and cook on low for 10-12 hours, until the roast is tender and at least 155 F on an instant-read meat thermometer. Remove the roast from the slow cooker* and place on a serving plate. Tent with foil and let stand for 10 minutes. Scoop out the apples and place in a serving dish. Then slice the roast to serve. *If you have a newer, hotter-cooking crockpot, cook on low for 7-8 hours or until roast registers 155 F.